So you're new. 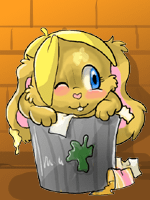 During the first six weeks on Powerpets, you can dive through the dumpster and pick up things veteran players no longer have a need for. Pick up to three items every day! Enjoy.